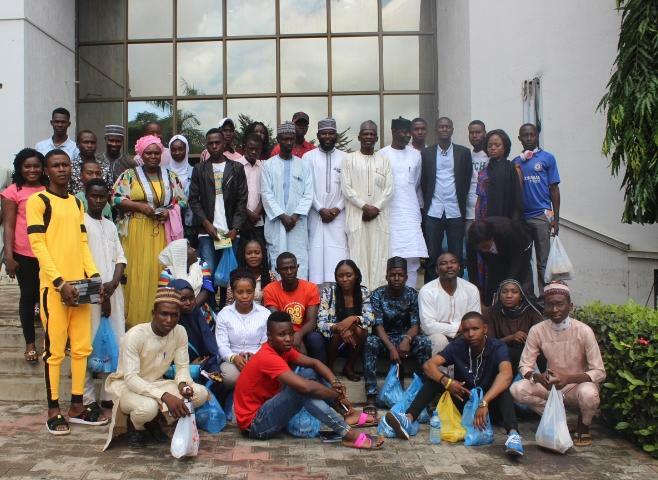 On Friday, 10th August 2018, we were pleased to receive the staff and students of the Estate Management and Valuation Department from the Federal Polytechnic Kazaure on an excursion visit. The tour began from the Brick City Phase II Kubwa at about 9am, The Project manager Engr Umar Emigba, gave them the history of the entire brick city and also talked about the benefit of bricks which includes; low cost of maintenance, solidity, impervious to water penetration, thermal transmission, etc. He also emphasized on the importance of a good building foundation, how to access and purchase a house with Urban Shelter, the cost of houses, and payment term. The students saw the bungalow houses at the Phase II and then proceeded to Phase III to see the other building types. They also went to the Phase IIII where they met the Project manager Arc Yakubu Mohammed who took them around the construction site, showed them the ongoing shopping mall and observed how facing bricks were being used. After the Brick City Kubwa, they were excited to visit the Bellavue Residences at Life Camp. They were thrilled by the estate and humorously asked if they could spend a night there. The Bellavue project managers Mrs Shade Bankole of Phase I and Engr Ibrahim Zubairu of Phase II enlightened them about the projects. They were excited to meet a female project manager that was able to produce such a beautiful estate, They compared both the finished houses and unfinished ones and looked closely at the construction materials. They didn't want to leave the site. After the site tour, they finally visited our head office to meet with the Building services team consisting of the Quantity Surveyors and the Architecture units. The Head of the Quantity Surveyors Mr Suleiman Ibrahim, and the Head of Architecture; Mr Khalid Gimba educated them about their fields, emphasized the importance of not compromising quality, making sure cost is within budget, and using modern building designs. They were super thankful to the USL management for the warm reception and rare opportunity.